North Creake towermill was quite small, although having 5 storeys the tower was only around 30 feet high. The mill ran two pairs of stones, was built of red brick and described as newly erected in 1820. To be Sold by Auction. By THOMAS PLATTEN. On Thursday 17 February 1820. Between the hours of 3 and 5 o'clock in the afternoon. At the Lord Nelson Inn at Fakenham in the County of Norfolk. A Capital MESSUAGE or Tenament...with about half an acre of land and a newly erected Tower Wind Mill with the going gears and tackle thereto belonging, situate in North Creake in the said county. The above Premises are Copyhold of the Manor of North Creake Thorpe Hall. 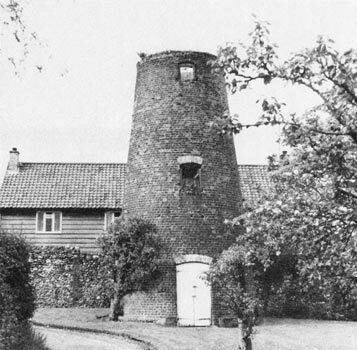 The mill being the only one in the parish was offered for sale privately in 1825 with an attached bakehouse. To Millers & Bakers. To be Sold by Private Contract. A Desirable SITUATION for carrying on the Business of a Miller & Baker on a small scale, consisting of a substantial brick & tiled Messuage, with baking office attached, a tower wind-mill at the back thereof & about half an acre of excellent arable land adjoining situate in North Creake. The Premises are in good repair & the Mill, being the only one in the parish, is calculated to command a repectable home trade. Apply to Mr. Young, Solr. Burnham Market. A Dwelling House with Baking Office, excellent brick built TOWER WINDMILL and Outbuildings, Garden etc. situate at North Creake near Burnham in Norfolk and now in the occupation of Mr. James Cuthbert (who is under notice to quit at Michaelmas next) at the yearly rent of £35. Apply to Kent & Watson, Solicitors, Fakenham, at the Place of Sale, or to Mr. Butcher, Auctioneer, Norwich. WANTED immediately, a Journeyman MILLER. Apply to Mrs. Sayer, of Creake, Norfolk. Windmill & Bake Office to Let at North Creake. With good Dwelling House & about Half an Acre of Land, to be let or sold, with possession at Michaelmas next, at North Creake. Applt to T. Everitt, North Creake, Fakenham. ROBERT SPICER has received instructions to offer for Sale by Auction at the Jolly Farmers Inn, North Creake early in November. The following valuable and desirable Freehold PROPERTY, comprising the capital and old established BRICK TOWER WINDMILL with two pair of Stones and other Mill Fittings. Also a BAKE OFFICE, DWELLING HOUSE & about Half an Acre of excellent Arable LAND. Possession can be had of the above Property on the 3rd Day of November 1881. The Property presents an excellent opportunity for a Miller & Baker requiring a business of this kind. ROBERT SPICER has received instructions to offer for Sale by Auction at the Jolly Farmers Inn, North Creake on Monday November 7, 1881 at 2 for 3 o'c. Possession can be had of the above Property on the 8th Day of November 1881. WANTED, a steady respectable man to work a windmill & assist in bake office. J. & H. Goshawk, North Creake, Norfolk. Mill dismantled & refloored & staircase built perhaps when wings added to Mill House, sometime after 1900.